How to Reboot the Global Economy? 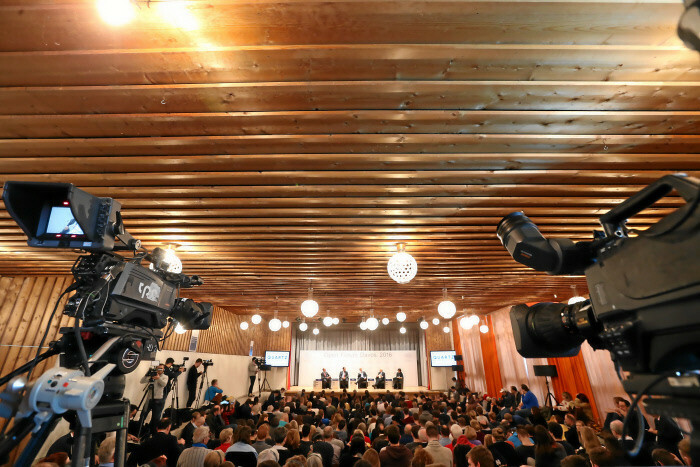 One of the biggest challenges facing the world today is one that ties into many of the other discussions taking place in Davos. The migration crisis, inequality, the gender gap, sustainable development and how to transition to a low-carbon economy – they will all be near impossible to achieve without robust economic growth. The obstacles to this are mounting. Growth is slowing in China (as discussed in another Davos session this morning, which you can re-watch here), the IMF has again reduced its global growth forecasts, and PwC’s Annual Global CEO Survey found that just 27% of business leaders think growth will improve this year. Head of the IMF Christine Lagarde has called it the “new mediocre”, but could it be worse? This is a topic we’ve explored in detail on Agenda. And if growth does get back on track, will it be inclusive, and why is this important? On the subject of Nobel economists, four of them have shared with us their biggest economic challenges for 2016. How to manage risk, sluggish productivity, deteriorating patterns of growth, relocating refugees all featured. What else keeps leading economists up at night? Meanwhile, Enda Kenny, Taoiseach of Ireland and also a panel member, laid out his 3-point plan to manage Ireland’s recovery. The Celtic nation has come a long way since the dramatic shocks of 2010, and is now the fastest growing economy in Europe. Can it keep going? The first question is for Brazil’s Finance Minister, Nelson Henrique Barbosa-Filho. With Brazil forecast to contract again, is contraction the new normal? No, says Barbosa-Filho. What we are witnessing now is just a transitional phase. Brazil, like many emerging nations, is merely adjusting to a global situation. Brazil benefited from a global commodities boom which reduced poverty and improved productivity. 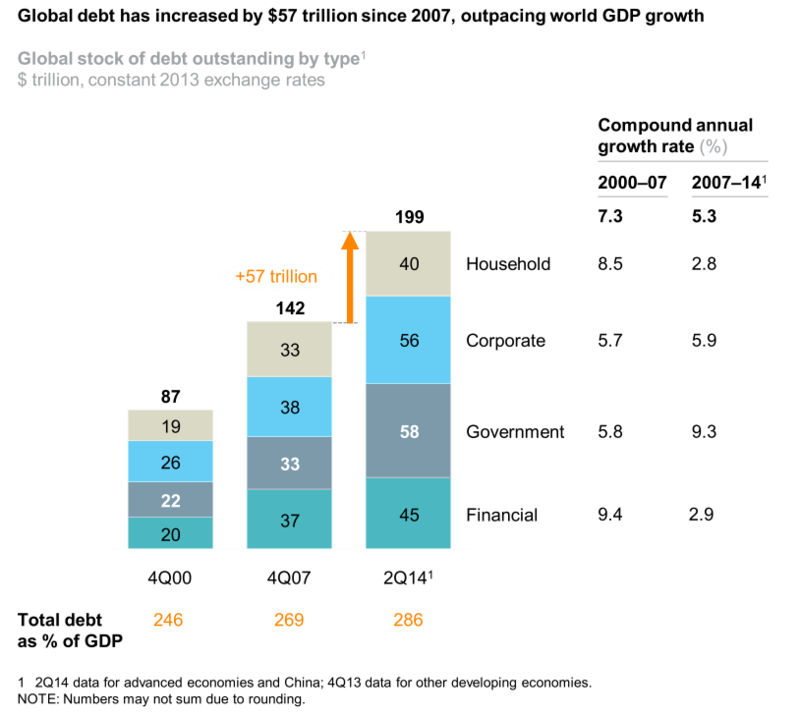 This stage has passed, and we need to prepare for a new phase for the global economy. China is also in a period of transformation. Fifteen percent of global economic output comes from China, is this something we should be worried about? Zhang Xin says she is concerned, but not because the Chinese economy is in danger of collapsing, but because of the transition from fast to slower growth. To many countries, China’s growth of 6.9% for 2015 would be considered “very nice,” but the world’s second largest economy is different, says Zhang. Basically, it’s used to it being higher. Austerity measures in Europe, and the small doses of it in the US, are a major contributing factor to the weak global economy, says Stiglitz. The underlying problem, however, is a lack of aggregate demand, a lack of global demand. What’s are the factors contributing to this? Growing inequality is one. Those at the top don’t have to spend as much of their income as those at the bottom, who are spending 100% of their income just getting through their daily life. Meanwhile, countries all over the world are undergoing a structural transformation. This is a hard process, and it almost never happens smoothly. Kenny says his country should be the model for how others can emerge from a desperate economic situation. Part of this is giving young people hope. Is GDP a reliable measure of growth? Not according to Joseph Stiglitz. 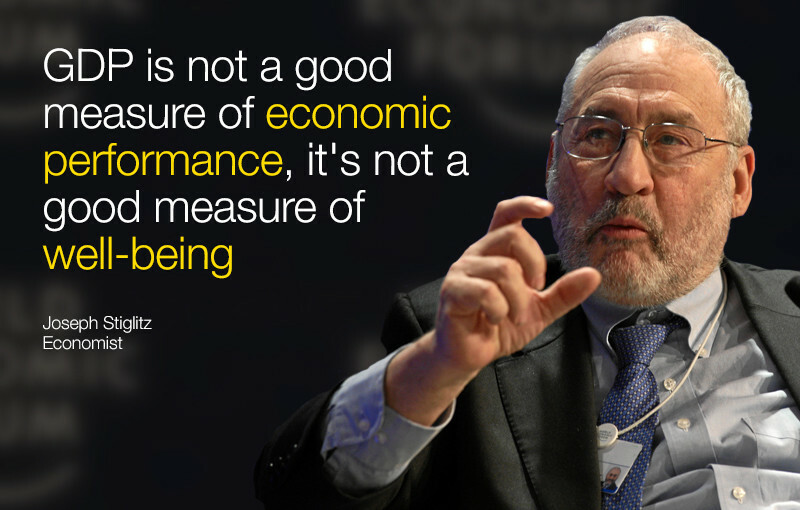 Stiglitz also says he admires Bhutan, which measures what it calls “Gross National Happiness”. GDP fails as a measure in other areas, too. For example, if we have a planet that is being polluted to the point that our lives are at risk, then what good is GDP? And while GDP has increased every year in the US since 2009, most Americans are worse off than they were a third of a century ago. The benefits are going to the top while wages at the bottom are lower than they were 60 years ago (adjusted for inflation). What is the outlook for oil producing nations? “There is a phenomena called the ‘natural resources curse’”, says Stiglitz. Having them doesn’t necessarily guarantee success. Indeed, some countries with a lot of natural resources are not doing well, while others who don’t have any, like Switzerland, are flourishing because they are diversifying and strengthening human resources. 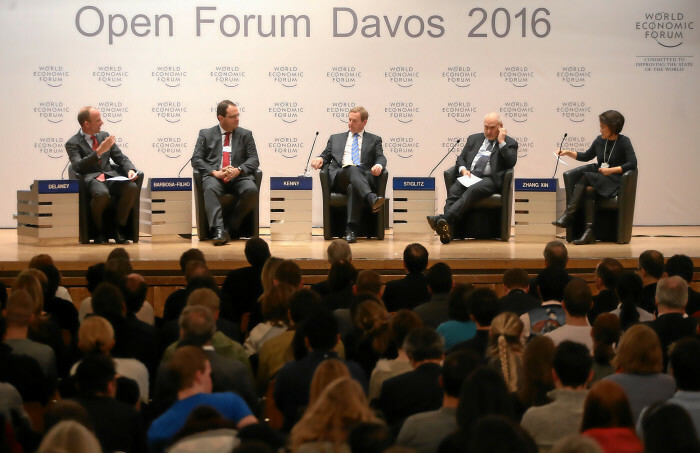 How can governments catalyse growth? It’s about investing in people, says Kenny. “An economy is an engine,” he adds, “and it’s an engine that can provide resources to invest in people." But countries do have to manage their public finances prudently, allowing them to make better decisions. The circumstances in each country are different, says Stiglitz, but in the US reforming the tax system would be a good start. The current system is regressive, he says, while the US has also underinvested in infrastructure for far too long. The US can borrow at almost no cost, so why doesn't it do it? The social returns could be enormous. The government also has to take a leading role in promoting technology. Virtually all the important innovations we benefit from, such as the web browser, were based on government research. China, meanwhile, is very different. “We’re actually calling for the government to do less,” says Zhang. It’s a country where the government owns half the economy, and it needs to reduce its involvement. In China, says Zhang, the days or finishing your degree and working for an established company are half gone. Now many people are starting their own business or joining a start-up. But while innovations are exciting, says Stiglitz, the rate of productivity has slowed down, despite advances in tech. If those people who lose their jobs in the Fourth Industrial Revolution can find a new one, then it may be a smooth transition. But without the government, it won’t necessarily lead to more jobs. Is greater taxation the answer? Stiglitz agrees “100%” with the suggestion that we need to deal with people and companies that aren’t paying enough tax. “The most important social responsibility is to pay your taxes,” he believes. Every downturn will eventually end, concludes Stiglitz. The question is, how many broken bones will there be?